Sometimes we wear scarves or gloves to be fashionable, but not every accessory was meant to wow onlookers. It’s not unreasonable to want to feel like you’ve got the upper hand if a bad situation were to land in your lap. This is especially the case if you live a bit of a rough-and-tumble life, with a penchant for injuries. While these Kevlar Cut-Resistant gloves can’t save you from everything, they’ll certainly guard you against scratches, cuts, and scrapes. 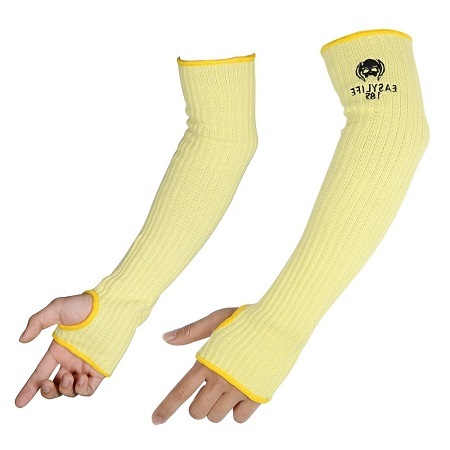 These are DuPont Kevlar brand, and double-ply knitted to give you seamless construction and make them more than able to conform to any arm. They stretch comfortably so that they’ll stay in place even when you’re in a constant state of motion such as riding a bike or working in the garden. These come in medium or full-sized, and will additionally provide you some light protection from heat. They’re 18” long and come in a pair at $19.99 regardless of what size you choose. These were made to be multi-purpose, so whether you find yourself doing work such as glass or knife handling, food service, warehousing, gardening, or any other instance where you might get a cut or scrape, these could be quite useful. If yellow is your color, then you could always sport them in the winter, especially if you have long walks home at night in less-than-desirable areas.